Inflatable batting cage is a blow up baseball batting cage for players to play and practice their baseball hitting and pitching skills. The benefits of using air batting cage with nets are obvious. One is all the baseballs or softballs will be blocked by the backstop netting inside the cage, so you don’t have to run and collect all balls. 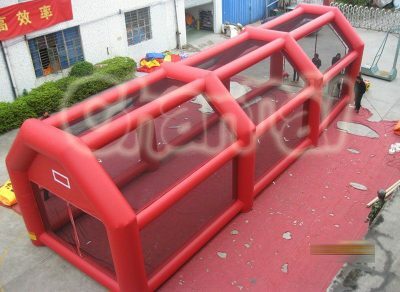 Another is inflatable baseball cage can be easily moved around with your team, blow it up and put it away just take several minutes. Inflatable batting cages are not only for professional baseball players like pitchers and batters in leagues, they also can be set up for your home, backyard and any other event. 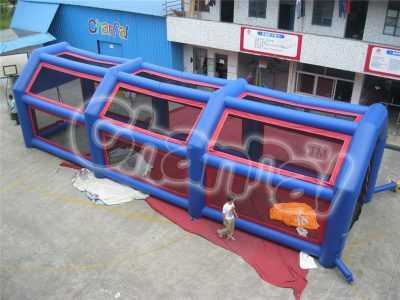 Channal Inflatables is a professional inflatable batting cage manufacturer in China, we also produce other inflatable baseball games like t-ball inflatable game for young kids.